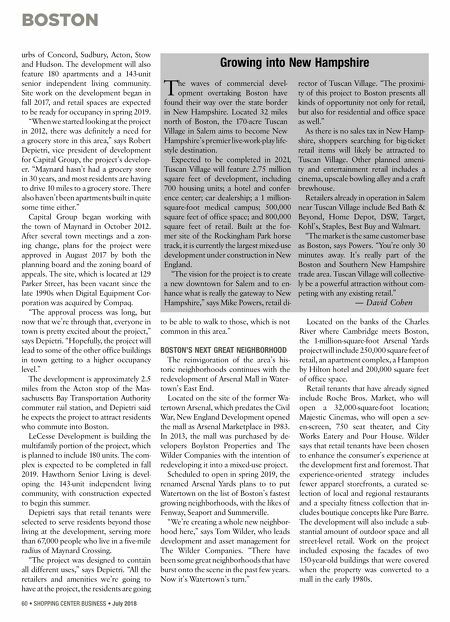 BOSTON July 2018 • SHOPPING CENTER BUSINESS • 61 "We're representing and refurbishing the historic buildings with beautiful ma- sonry and original steelwork," Wilder says. "We're going to juxtapose those with new buildings that have elements of that feel and look with steel, brick and stone. We're striving for authenticity today, and we have the benefit of historic buildings that have that authenticity." A NEW HOME FOR NEW BALANCE Just across the Charles River from Watertown in Boston's Brighton neigh- borhood, a former industrial patch of land is currently being redeveloped to become a vibrant 1.7-million-square-foot mixed-use development with a new train station offering direct service to down- town Boston. Currently under construc- tion, Boston Landing has already had its biggest tenant move in. Brighton-based New Balance moved its 250,000-square- foot world headquarters to Boston Land- ing and will soon be joined the Boston Celtics, Boston Bruins and Bose. 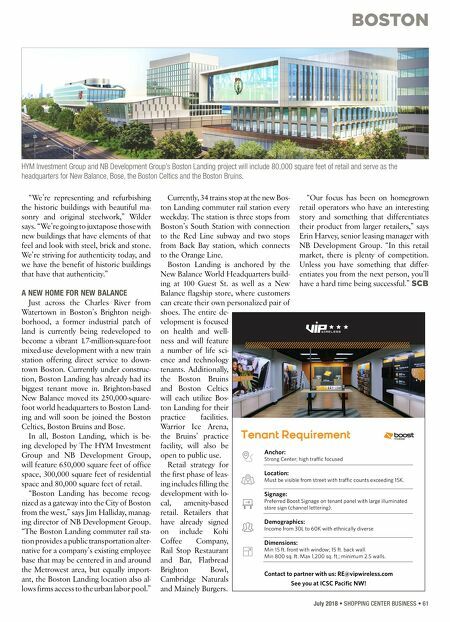 In all, Boston Landing, which is be- ing developed by The HYM Investment Group and NB Development Group, will feature 650,000 square feet of office space, 300,000 square feet of residential space and 80,000 square feet of retail. "Boston Landing has become recog- nized as a gateway into the City of Boston from the west," says Jim Halliday, manag- ing director of NB Development Group. "The Boston Landing commuter rail sta- tion provides a public transportation alter- native for a company's existing employee base that may be centered in and around the Metrowest area, but equally import- ant, the Boston Landing location also al- lows firms access to the urban labor pool." Currently, 34 trains stop at the new Bos- ton Landing commuter rail station every weekday. The station is three stops from Boston's South Station with connection to the Red Line subway and two stops from Back Bay station, which connects to the Orange Line. Boston Landing is anchored by the New Balance World Headquarters build- ing at 100 Guest St. as well as a New Balance flagship store, where customers can create their own personalized pair of shoes. The entire de- velopment is focused on health and well- ness and will feature a number of life sci- ence and technology tenants. Additionally, the Boston Bruins and Boston Celtics will each utilize Bos- ton Landing for their practice facilities. Warrior Ice Arena, the Bruins' practice facility, will also be open to public use. Retail strategy for the first phase of leas- ing includes filling the development with lo- cal, amenity-based retail. Retailers that have already signed on include Kohi Coffee Company, Rail Stop Restaurant and Bar, Flatbread Brighton Bowl, Cambridge Naturals and Mainely Burgers. "Our focus has been on homegrown retail operators who have an interesting story and something that differentiates their product from larger retailers," says Erin Harvey, senior leasing manager with NB Development Group. "In this retail market, there is plenty of competition. Unless you have something that differ- entiates you from the next person, you'll have a hard time being successful." SCB HYM Investment Group and NB Development Group's Boston Landing project will include 80,000 square feet of retail and serve as the headquarters for New Balance, Bose, the Boston Celtics and the Boston Bruins. Contact to partner with us: RE@vipwireless.com See you at ICSC Pacific NW! Anchor: Strong Center; high traffic focused Location: Must be visible from street with traffic counts exceeding 15K. Signage: Preferred Boost Signage on tenant panel with large illuminated store sign (channel lettering). Demographics: Income from 30L to 60K with ethnically diverse Dimensions: Min 15 ft. front with window; 15 ft. back wall. Min 800 sq. ft. Max 1,200 sq. ft.; minimum 2.5 walls.